Blurb: Holly Chase has the job of saving souls, but it is her own that she realizes needs examining. On Christmas Eve five years ago, Holly was visited by three ghosts who showed her how selfish and spoiled she’d become. They tried to convince her to mend her ways. Now she’s stuck working for the top-secret company, Project Scrooge, as their latest Ghost of Christmas Past. Every year, they save another miserly grouch. Every year, Holly stays frozen at seventeen while her family and friends go on living without her. So far, Holly’s afterlife has been miserable. But this year, everything is about to change. My Thoughts: I was asked by the publisher if I would like to read THE AFTERLIFE OF HOLLY CHASE just before Christmas. Looked at the blurb and I immediately thought Christmas Carol spin off, which is a good thing. To cap it off when I received the email I was watching a Muppet Christmas Carol on the TV (as you do) so it seemed like I was meant to read it. And I am so glad I have. Because it is so much more than three ghost visiting a mean old scrooge and then that scrooge turning his/her life around with everything coming up roses. No – Holly ignores the warning and dies. Bummer! Of course, she doesn’t go to heaven – well she is a bad girl after all – but she doesn’t go to hell either, instead she finds that she is in some sort of half-way house where she is hired as The Ghost of Christmas Past for a company that runs “Project Scrooge.” A new “Scrooge” is found every year and then the team swings into action to encourage the chosen scrooge to change their ways and not die. Lots of research goes on before the big event which takes place each Christmas Eve. As the Ghost of Christmas Past, Holly gets to mind meld with the scrooge to find out what made them like they are. Holly, our failed scrooge, is a truly unlikable person with no redeeming qualities and totally unrepentant even in death. After five years Holly is still with ‘Project Scrooge’ with no attitude change, she just does her job and feels unjustly treated, and just a little bit lonely. Then Scrooge number 173 is picked – and he is a good looking guy who, once she starts delving into his mind, Holly discovers she has a lot in common with. And after finding that commonality she finally starts to recognise that by saving him she has to admit she might not be a very nice person after all. Can she actually start to hope that she may be able to move on to a better place? Will she find the courage to break all the rules to get there? The author portrays Holly’s growth as a character so well. The Holly on the first page is a whole different person just before THE END. While Holly is the star of the story – and front and centre all the time. The supporting cast is very good as well and carry her story very ably. There has to be a boss, and of course if there is a ghost of Christmas past there needs to be two more for present and future. As well as the ghosts, there are the tech people and a sweet little work experience PA who is assigned to Holly just as Scrooge 173 is selected. So that was good, now the grumble. I have to confess it got a bit bogged down for me in the middle – so no I wasn’t glued to every page from beginning to end. There was also a little bit of information dumping – where the characters in the book explained who they were talking about, and what the role was in the story. I understand this would be for those readers who hadn’t read A Christmas Carol so they could follow the action, but I found it a tad annoying. 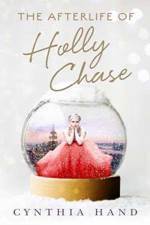 Having said that, they were tiny niggles and THE AFTERLIFE OF HOLLY CHASE is still an above average read and I recommend it to anyone who loves wisecracking YA paranormal and Christmas. I loved the ending – take nothing for granted. C – Above average – was very readable and I really liked it but was easily able to put it down and walk away for a while. With thanks to HarperCollins Publishers Australia and the author via Netgalley for my copy to read and review.